Righto, 2 showcase games have been played, with 12 more more to go. It seems 7 of those will be broadcast LIVE. I'm okay with this. Looks like they're testing the waters overseas, so it's 5 non-Perth games + 2 Perth games to go LIVE. So, to see tomorrow night's Force vs APDs matchup in full, you need to GO to the game at HBF Park! In Australia, national broadcaster SBS will offer seven more matches live and free right around the country on the SBS Viceland Channel, the SBS On Demand app and online via sbs.com.au. Plus, Australia's one-stop TV sporting shop, Fox Sports, will broadcast matches live and offer anytime viewing on the popular new Kayo streaming service. 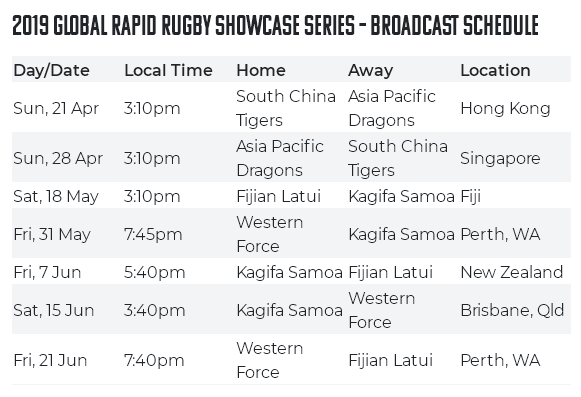 In Asia and the Pacific, the seven games will be broadcast live through Fox Sports Asia and Star Sports and its multitude of local channels that include coverage into China, Hong Kong, Indonesia, Macau, Malaysia, Philippines, Singapore, South Korea, Thailand, Vietnam, Fiji, Nauru, Solomon Islands, Tonga, Vanuatu, and Western Samoa. To launch the 2019 Global Rapid Rugby Showcase Australia's Western Force played home games in Perth against the World XV and the South China Tigers. As an example of the brand's appeal, SBS recorded an average viewer audience of 64,000. Last edited by Kiap; 12-04-19 at 00:42. Hopefully the Force match in Tokyo against the Moondogs Wolfpack will also make it onto our screens. Definitely. I dont really see the point of the Force playing it if it isnt the case. I'd have thought the point was to raise awareness of the GRR in Japan, possibly directly with the Sunwolves who might struggle to put together a SR side next year. Seems like a strange point. Broadcasting the game to Force fans should be the top priority. Broadcasting across all the nations should be a top priority, even just streaming it on their website gives fans from all locations the ability to view. From when I used to frequent G&G there were some people from over east interested. Im disappointed, Im outta town and have no ability to be able to view the game. I can see why the fans arent taking these games seriously. Rapidrugby and the organisers dont seem to be taking tonights game seriously either. AFL used to delay games in its home state to force fans to go to the game to watch. GRR tried this, but it didn't work. In the UK many of the Premier League games aren't shown at all so that people go to the local games (both Premier League & club games) so perhaps the fact no one has bothered to rock up has bought this on. Come to the game or miss out. Simple. It's a bummer for those that want to go but commitments mean they can't but for those who sit on their butts not supporting the comp until now, well, come to the game, easy. No one is coming to tonights game. It looks like about 5-7k max right now. Probably less without the junior promotions.. It would have been a good idea to atleast provide a stream if broadcast options werent available. I wonder why the late start then if we arent clashing with Super Rugby? Broadcasting to the rest of the world is a priority because the point of GRR (I thought) is to try and grow rugby in areas which are being ignored at the moment. Demanding WA sees the game but not caring about the rest of the world is an inward-looking philosophy of the type that RA is guilty of. So if your children say they won't eat their veggies you'll give them desert anyway? We will be clashing with Super Rugby if we kick-off any earlier. The Rebels - Stormers game kicks off at 19:45 Melbourne time, and given average delays a 80 minute rugby game can eaasily go for nearly 2 hours. Tonight's kick-off time of 19:45 is based on trying to avoid two games being played at the same time and a clash.